Recently, I took my daughters out to the Clearwater Arena in Sarnia for an open skating day. 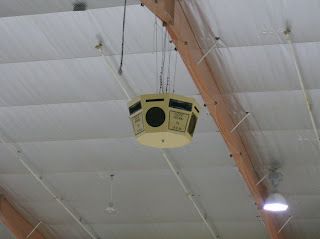 While watching the girls from the seats, I noticed a single speaker hanging down from the centre support of the arena ceiling. The speaker had multiple drivers on all sides of the cabinet. It was the OctaSound speaker by K.D.M. It is a unique design for a loudspeaker system and somewhat common in smaller arenas. They had music playing back over the speaker during the skating time and it sounded okay. Definitely, only for music playback and maybe one announcer's microphone. It would be inadequate to use it for full-blown concert sounds. With all of the new speaker technologies available, I wonder why they have not upgraded to a better audio system. Here is a picture I took of the speaker in the arena. Party In the Point - Featuring "Borderline"
The Carvin C3248 Mixer explained.